Battery Repacking is a great way of bringing your old battery pack back to brand new condition. This process involves disassembling the pack completely, removing all of the old internal cells, and replacing them with brand new cells. 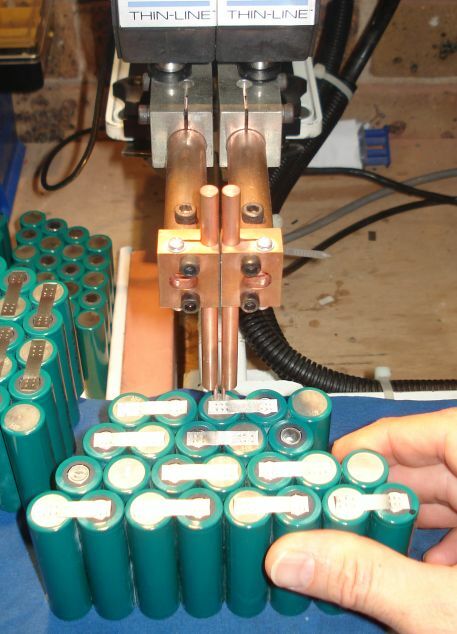 Spot welding equipment must be used to achieve a quality rebuild. Our workshop is equiped to do this. - Repacking your old battery can be cheaper than buying new. These chemistry types are far too dangerous to repack with saftey. - Cordless Drills.... especially sub $100.00 budget versions like GMC, Ryobi, ARLEC, WORX, etc. ..These are generally NOT economical to repack! Generally, if your battery is available on our website as a new replacement, then it is likely to be a cheaper and easier option to buy it new than to repack. - Battery packs used in industrial applications and specialised instrumentation such as surveying equipment etc. If you feel your battery may be suitable for repacking, please use the link below to request a quote.